Knitting Traditions began in 1995 as an online mail order business. I started with selling my patterns through my catalog and began importing beautiful yarns from England. I carried breed-specific Aran yarns that were worsted spun, as well as the Creskeld line of Guernsey yarns, which offered 18 colors. I soon outgrew the one room in my house that was my dedicated office and moved across the street to a storefront with more room than I needed! I branched out from offering yarns appropriate for Arans and ganseys to knitting tools, books, Scandinavian yarns, Shetland yarns, any yarn that was used in traditional knitting. I was lucky to have my friend Karen Frisa work with me until I decided to discontinue the mail order business in 2002. My focus has always been educating knitters about historic and traditional knitting. My knitwear patterns are based on historic garments, motifs, and/or techniques. In addition, I have created almost 40 workshops, also based on traditional garments and techniques. Technology has made it relatively easy to create video, and I am using this medium more and more in my teaching. I have produced three DVDs on color stranding, ganseys, and Sanquhar gloves for knitters who cannot get to my workshops, but I have found them to be very useful to my teaching in the classroom as well. My book Knitting Ganseys has been a success, and I am happy to have had the opportunity to revise it in 2018. New books and workshops will grow out of my future travels where I research old knitting. I often hear from knitters who are unable to travel or to take a course at venues far away from where they live. The School of Knitting Traditions, an online school, is being formed now and will serve as a place for knitters interested in traditional techniques to take classes. Some of these courses will be too in-depth to fit into the structure of the larger knitting events, and are perfect for self-study. I feel blessed to be able to travel, to meet and teach many people, and to live a creative life, all because of knitting. 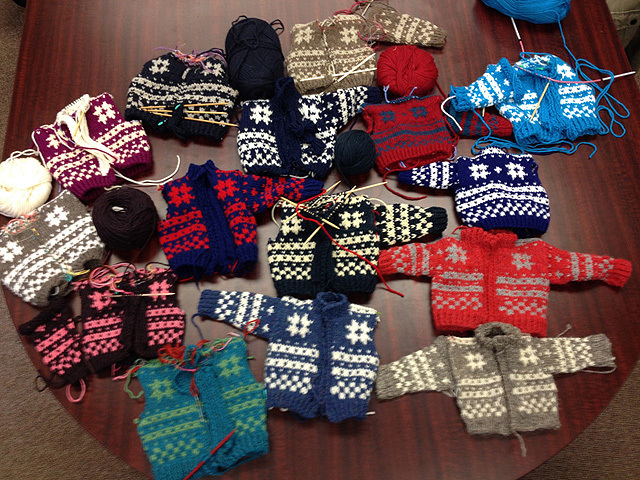 My students’ work in the Norwegian Fana Cardigan class!